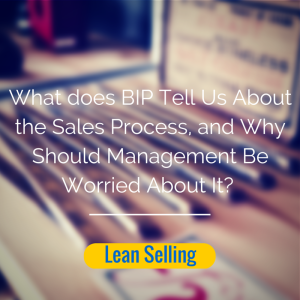 What Does BIP Tell Us About the Sales Process and Why Should Management Be Worried About It? In my blog posts, I often write about or reference sales process. But what, exactly, is a process? Simply put, a process is a series of steps or activities that someone or something (like a machine or software) follows to create something. Processes almost always have more than one step, and each step adds value in some form until the completion of production of a final product or service. In manufacturing environments the output of the process is typically a tangible product, where in service industries it is the creation of some intangible value for a customer. In classic manufacturing environments, as the product in production moves through the process it is called Work-in-Process, or WIP. The value that is added at each step is carefully monitored and WIP becomes more valuable as it moves through the process because more labor, materials, or machine time has been added—or invested—in it. For companies that track the changing value of WIP on a regular basis, they will see an increase in the value of their WIP inventory as items move through production, and a decrease after the product is finished and sold. One of the important objectives of improving a manufacturing process is to reduce the total value of inventory, in the form of materials, WIP, and finished goods waiting to be sold. Service industries are less likely to keep such careful track of their WIP, but many more sophisticated companies keep track of direct labor provided to a client, often in the form of an hourly cost of service. However, possibly because they are dealing with intangibles, many service industries seem to believe that at least some of the cost of delivering their services to customers cannot easily be captured, measured, or valued. What does this have to do with BIP and sales? Sales processes, like services, exist to produce an intangible, which is to have a buyer make a decision to buy something, hopefully from your company. The salespeople involved in creating this intangible and company management, rarely think about capturing and reporting on the total amount of value that is added to a buyer moving through this process. I know of no company that treats this cost the way manufacturing companies do. To help highlight this issue I coined a phrase called “BIP,” or Buyer-in-Process. BIP is the sales process analog of WIP. It is the cumulative cost of all the value that has been added (i.e., investment made) in a buyer at each step of the sales process. BIP increases until the buyer makes a buying decision (or not) and then exits the sales pipeline. 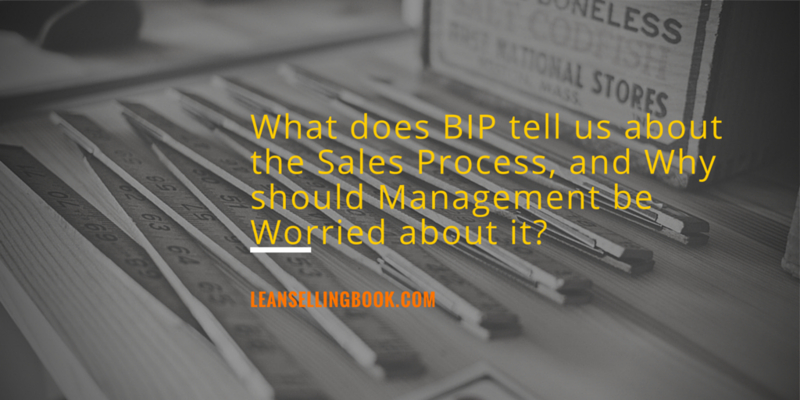 If you are a sales executive, CFO, CEO, COO, or other senior-level business executive, imagine about what embracing the concept of BIP can do to help you understand the true cost of your sales system and how much investment is being wasted. If you knew how much value is being added (investment made) to buyers in your organization’s sales process every day, you likely would be shocked at the total cost of inventory (in the form of BIP) sitting in your sales pipeline. Worse yet, think about what happens to all this investment and all this BIP inventory when buyers buy from your competitor or just “go away.” It all becomes waste. It is analogous to pulling product off a manufacturing assembly line and then throwing it away because it is defective (referred to as scrap). In a service business it would be like stopping a customer project half-way and never getting paid for the time your company invested or the value you provided to the client. An unavoidable expense in sales that can’t be reduced, you say? I don’t buy it. Do you believe that you doing everything that can be done to identify and eliminate waste in your sales process? If the sum of these wasted investments in sales were accounted for, the total cost as percentage of company profits would be staggering for any senior executive. These are costs that would be “written off” from a financial accounting point of view with other processes. But that’s not what happens in the real world of sales. Instead, all the investments made in a buyer are buried in the total selling cost, universally accounted for as a general selling expense. This obstructs taking a hard look at the real cost of sales and—more importantly—at where waste can be eliminated to generate real money saved by reducing the amount of BIP. I don’t expect corporate accounting systems to change anytime soon to accommodate this radical idea of tracking BIP. However, simply thinking about the sales process from this new perspective can help senior sales and business executives see where they might reduce waste and dramatically increase sales productivity. Implementing a Lean Selling process will begin to identify where value and investments are being made and where waste is hurting the bottom line. This is important because the cost of customer acquisition is the single biggest expense for most companies. Before we jump into how Lean Selling addresses this issue, it is important for you to undertake a quick, high-level assessment of the maturity of your existing sales process. I will walk you through that that in the next installment.